A permanent component of Dave Grohl's pedalboard, the Boss DM-2 Analog Delay Effects Pedals is a highly sought-after delay which is connected to both the MXR M-101 Phase 90 Pedal and the Boss TU-2 Chromatic Tuner. "This is set for a couple of repeats," says Josh Klinghoffer's guitar tech about the Boss DM-2 Analog Delay Effects Pedal. You can see a shot of Beck's pedalboard 0:05 into this video. The Boss DM-2 is on the bottom row, the second pedal from the left. 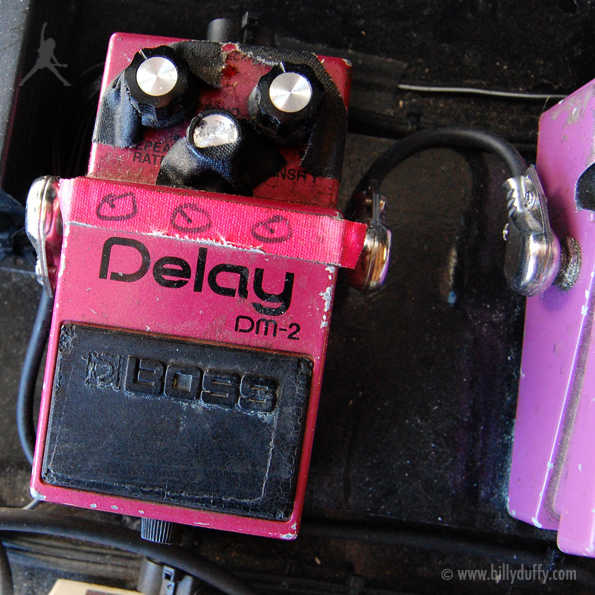 A DM-2 Delay is seen in Mike McCready's pedalboard. This was was likely used to create many of the strange sounds on Cobain's home demos. It was used live and in the studio on If You Must. Check the comment section on this source. A person named Graham asked about this pedal and Trent confirmed it. It's sitting in the back of the pile. In this video, Gary featured a selection of Boss guitar effects pedals he uses including the [DS-1](http://equipboard.com/items/boss-ds-1-distortion-guitar-effects-pedal), [CE-2](http://equipboard.com/items/boss-ce-2-chorus-guitar-effect-pedal), DM-2, [OC-2](http://equipboard.com/items/boss-oc-2-octave-pedal) as well as the [BF-2 Flanger](http://equipboard.com/items/boss-bf-2). On the [Gear page](http://www.billyduffy.com/gear/boss-dm-2-analogue-delay-pedal/) of Billy Duffy's website, he says, "People used to bribe the producer to tell them what pedals and effects I used to get the guitar sound in the beginning of the song, that whole kind of mystical Easterny sound. The story that goes along with that is, it was a whole BOSS pedal board. I definitely had two delays in it, ‘cause there are two delays working against each other —long and short delays. It’s 400 and 800 milliseconds, approximately, at the beginning of the song." Under Jerome's workstation a few guitar pedals are seen. The red pedal is definately a boss delay due to the layout and the abscence of white lettering is a sign that it is not the wazacraft design. 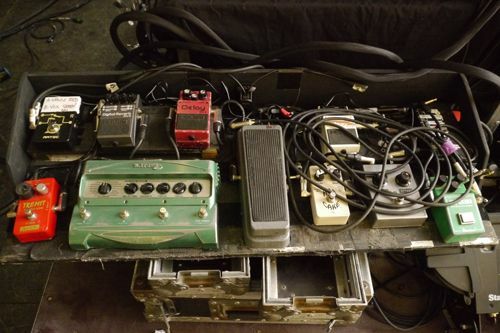 This photo of Hugh Harris' pedalboard (from a Nov 2007 article) shows he uses a Boss DM-2 Delay Guitar Pedal. 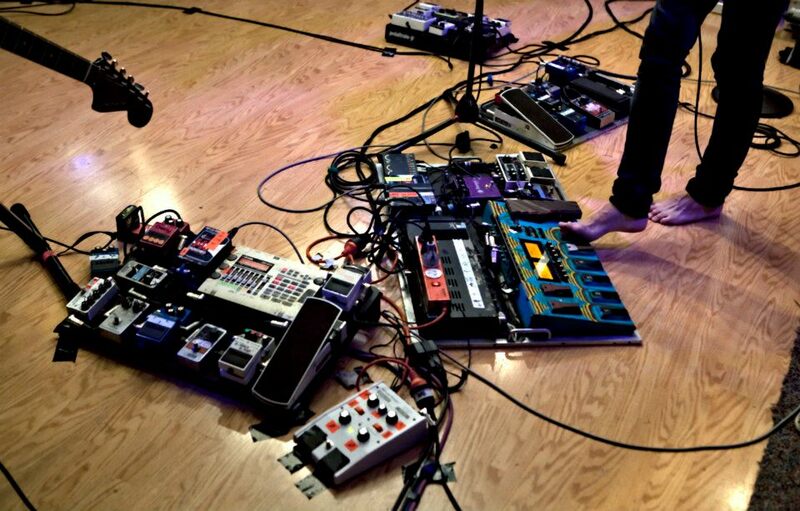 It can be seen in the top row of his pedalboard, 2nd pedal from the right. In this photo, Boss DM-2 analog delay is visible in Skjelset's board. And the three effects Steve used on this tour were a Boss Chorus, Boss Delay and a Morley Pre-amp Booster. At 7:24 of this "That Metal Gear" episode, they list John 5's gear with the Boss DM-2 Analog Delay included. At 3:45 in this rig rundown video, Justin Hawkins shows his old Boss Analog Delay pedal, painted black. Dan Hawkins' two Boss DM-2s can be seen at 15:34 in this video. A close up of Peter Holstrom's pedals at 1:14 in this video reveals his Boss DM-2 Delay Pedal. The above picture is a screen shot from Talking Heads' 1984 concert film Stop Making Sense. David's Boss DM-2 is visible throughout the film. Did some research and found this website showing all his pedals. In this photo [(source)](http://kulick.net/equip.shtml), the Boss DM-2 analog delay is visible in the board. Peter uses a Boss DM-2 pedal, according to [this](http://www.guitargeek.com/peter-koppes-the-church-2011-guitar-rig-and-gear-setup-diagram/) Guitar Geek rig diagram. A picture reveals that she uses a DM-2. In this Instagram post, Nigel Hendroff's Boss DM-2 Analog Delay Effects Pedal can be seen on his pedalboard. A Boss DM-2 can be seen above the Line 6 DL-4. I have a Fender Custom Shop Telecaster based on a ’62. I also have a ’61 Gibson SG my girlfriend bought me. I string them with D’Addario NYXLs, gauged .010-.046. My amps are ’67 and ’68 blackface Fender Pro Reverbs. I have a Boss DM-2 Delay, a Wampler Ego Compressor, a Walrus Audio Plainsman for clean boosts, and, for overdrives, I currently use an Oddfellow Effects Caveman Drive and a Jetter Jetdrive. My tuner is a Sonic Research strobe. "In addition Mike uses 3 Boss delay pedals: A DD-3 Digital delay marked 'Space', a DD-6 and an old school analog DM-2"
"From the other side of the Chandler a line goes to stomp boxes. There’s a Boss analog delay that I rarely use except to make crazy sounds, for when I break a string or when I’m just feeling like an idiot and want to screw around". More than likely he used this as a wash.
"I actually found an old CS-2 compressor, and I found the old three-knob red analog delay Boss had [DM-2] and, of course, the Blues Driver. But, then, I got turned on to the DS-1, and I’ve just been turned onto the new Mega Distortion [MD-2]." On the left there is a Boss delay pedal seen possibly being used by Peter's 2nd guitarist. "Sit back and watch as Boz talks through his pedalboard, explaining where he uses each BOSS pedal in the setlist, from the DM-2 delay that drives Certain People I Know to the RT-20 Rotary Sound Processor that brings drama to the climax of Meat Is Murder." I love delays always have and when you mix AHHH! You can see the Boss DM-2 Analog Delay being used in this video. It can also be seen on her 2014 World Tour t-shirt. Seen at the top-right corner of the pedal. Vintage analog delay pedals have made a comeback in a big way and the iconic Boss DM-2 leads the pack. The three button layout of repeat rate, intensity, and echo have become familiar, but in the early '80s, bringing this much delay to a compact pedal was a major step forward. You see a wide range of prices for DM-2 as the chips used in the circuit changed a bit during its production. this is a classic of 9 volt analog delays, right in there with the AD9, everyone knows this pedal... maybe not as badass as a memory man... I got this in a trade and sold it for a good amount of money. Honestly, as nice as the dm2 is, it doesn't do anything that's distinguishable from like a carbon copy once you're playing with a band. But if people want to pay big bucks for originals? hey? Ill take that money.